Our last 50th anniversary hurrah was a trip to North Carolina to visit our friends the Forresters and to see some of the beautiful sites in their area and beyond. To commemorate 50-years of marriage, we decided to tour the US and see some places we've never seen. We're going to have a laid-back summer visiting many of the places we've come to love in the Pacific Northwest and possibly even checking out some new ones. A girls trip with Road Scholars to visit historic homes and gardens in Georgia and South Carolina. We're having a "kick-back" trip in the Pacific Northwest this year. Come join us. WOW another place checked off our bucket list! We took a 2-week river cruise aboard the Viking Rurik from Moscow to St. Petersburg. Eastward bound to Connecticut for my 50th high school reunion and sights before and after. Our spring trip this year found us traveling southeast to Peru and Ecuador in South America. We are off for two weeks in China where we will see things of both fame and infamy. Come travel with us. Another year - another journey. We are staying on the west coast and poking around both new places and some we've discovered before. We love our life in our Journey. A visit to England and then some places on our lifelist! This years adventure is shortened due to Al having back surgery on August 1. We are off to discover the southwest. Years ago my brother went on the train through Copper Canyon and came home and told us we should make the trip some day. We finally did it but with a tour group rather than on our own! Join us on our trek to Alaska with our friends, the Doolittles, from Washington. Who knows what waits for us around the corner. To celebrate our 40th anniversary, we visited the land of downunder. We went on a tour and stayed in 5 star hotels, saw amazing sights, met great new friends and just had an incredible time. Come travel with us as we head off into this great land of ours. Join us as we discover new places, meet old and new friends, revisit areas we love and just plain have fun! We decided it was time to return to England and visit Al's sister. While there we took the opportunity to discover some areas we had never been to before. TheCalifornia deserts are awash with flowers this year. We've taken a few short trips to view the flowers and were certainly rewarded for our time. Another summer on the road discovering the United States and all it has to offer. 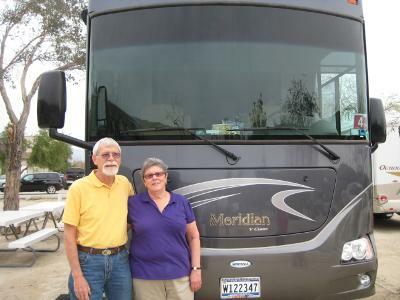 Come travel with us this summer as we discover the Western United States and Canada in our new motorhome. A quick trip to red rock country and their annual jeep safari. A sentimental journey back to where it all began with a 40th high school reunion thrown in for fun. Our first annual block party. Our new home one month after moving in. This is our very first trip we took in our new rig!! !